Pamela Matamoros has walked the halls of the Haring Center for the past four weeks, soaking up everything she can. Back at home, in Honduras, she did not see any inclusive education options, so she decided to take matters into her own hands. Matamoros started her own center, Eduktiva Centro Piscopedagogico, to help children with disabilities and learning differences reach their potential through tutoring, therapies and interventions. She came to Seattle as part of an internship called the Young Leaders of the Americas Initiative (YLAI), a US Department of State sponsored program which sends entrepreneurs from Latin America to the United States to learn innovative practices in their field they can take back home. Matamoros knew she wanted to teach as early as college, when she was tutoring her fellow students. Ten years ago, however, she started Eduktiva Centro Piscopedagogico to give hope and results for families with a child with special needs. This is a very common case for her, and she often takes on children pro bono because many families cannot afford to send their children to private therapists and tutors. Coming to the Haring Center, Matamoros said she had two goals: gathering more knowledge of inclusive therapies, and transforming her center into a business that can grow to help more children. As soon as she got to the Haring Center, she said she could not believe she was finally seeing what she had been reading about: inclusive education in action. “It’s inclusion heaven here. You can read about inclusion in a book and even see places trying to get there, but there are so few opportunities to see it working in everyday life like it is at the Haring Center,” she said. She started achieving her first goal by picking the brains of as many teachers, administrators and especially therapists as possible. In Honduras, there are not as many specialized therapists so she has had to learn how to become her own center’s physical, occupational and speech therapist. After a brief stop in Washington DC with the rest of the young entrepreneurs in this internship program, Matamoros is headed home where she plans to begin growing the business side of her center, starting with developing trainings for local teachers on inclusive education and special education. She is also excited because YLAI also has a reverse exchange program. 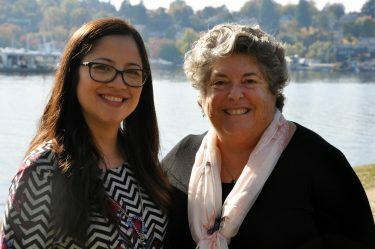 She hopes a Haring Center staff member will be able to travel to Honduras to help her conduct training and continue her work of spreading evidence-based inclusive practices.